With well over 100 Years of Service Experience, Anglers Marine Tedchnicians have provided Mercury Certified Service for over 30 Years. 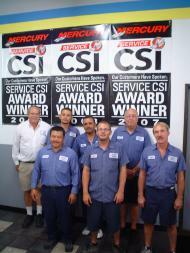 We are a CSI (Customer Satisfaction Award of Excellence) Winner Year After Year. Make your appointment at our Anaheim or Lakeside Location today and experience a Professional Dealership Dedicated to Customer Satisfaction. We schedule your repair and maintenance work on appointment because we respect the value of your time. We Service all makes and models. Anglers Marine specalizes in Restoration of late model boats. We will revitalize your boat with new Carpet and Upholstery as well as solving any Mechanical issues.